It’s commonly said that you “putt for dough” and “drive for show”. More than an hour after he took the 36-hole lead at the Chevron World Challenge in a stroke-play tournament for the second time in three weeks, Tiger Woods was a solitary figure on the putting green at Sherwood Country Club, working on a stroke that kept a strong round from being anything short of spectacular. Three weeks ago at The Australian Open we witnessed the power of Woods as he made another Sunday charge up the leaderboard. 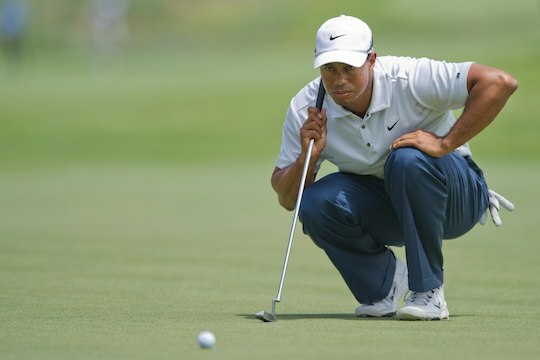 After beginning the final day at The Lakes six strokes behind the leaders, three birdies over the first nine holes saw Woods make the turn at three under and we got a glimpse at the Tiger of old. He finished five-under for the day and 11 under for the tournament, settling for third place, two strokes behind winner Greg Chalmers and a shot behind runner-up John Senden. Saturday’s 75 – due mainly to poor putting – had dashed Woods’ chances. While practicing after a round is common for professional golfers, it isn’t necessarily the case at an off-season money grab such as the Chevron World Challenge. Woods has rarely been seen working on his game after a round since the beginning of his two-year winless stretch after he claimed the JBWere Masters in Melbourne. The former world number one has admitted that he hasn’t put in the work on his short game that has been such a hallmark of his career. Tiger’s ball-striking again produced some jaw-dropping efforts during the second round at the Chevron. It was his putting, despite making several longer putts, that let him down. Woods missed three putts inside 4 feet and still shot 5-under-par 67. “That was the highest score I probably could have shot today,” said Woods. There was a time when a three-shot lead through 36 holes for Woods meant the tournament was over. Times have changed and Woods is putting in the hard yards. “I want the lead after the four days,” he said. Events in Sydney would still be on his mind where he led the Australian Open by one through two rounds only to bogey the first two holes of the third round to card a damaging 75. Tiger’s winless drought continues but there’s a palpable sense that it will not be for much longer and perhaps even this weekend at the Chevron.